Supplied as a pack of 6 x 7cm plants, being double ruffled flower types, all being unique colours as they are seed-raised and thus a random mix. Large, Ruffled & Speckled Blooms in double flowered forms. Every one is totally unique because it has come from seed! Adding delightful colour to your winter garden, these beautiful blooms, each of 2-3 diameter, are dainty to look at but incredibly tough whatever the weather! 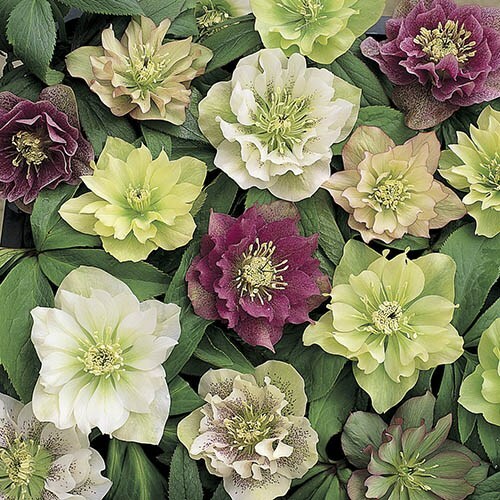 So easy to grow, they will slowly establish into small clumps, increasing in flower number year after year - it is not uncommon to have upwards of 50 flowers in 5 years. They thrive on shade, and lower light spots, yet can be grown well in pots provided they do not dry out in summer.